﻿ Norway’s Blood Command are a sharp sounding quartet fronted by piercing vocalist Karina Ljone. After two albums, including well-received predecessor Funeral Beach, and multiple EPs, the group have returned bigger and fiercer than ever with their strongest record to date Cult Drugs. They explode into the first track CTRL + ALT + DEL, with a pounding drum beat that prepares you for what is to come. They roll straight into title track Cult Drugs, the first song to be released as a single from the record. It’s a supercharged track with plenty of power, particularly when it comes round to the choruses. It is a song that highlights the hunt for acceptance and the challenges of trusting others. Blood Command are out to produce big tracks by taking on a sonic vibe with this record, which is notably evident in Quitters Never Smoke. With a synth introduction audibly similar to Icon For Hire or Muse, the track is energy-ridden, featuring smooth vocals and incredibly catchy choruses, encompassing a captivating chant of “whoa”s. Granted, the intense screams from the vocalist may not be everyone’s favourite dynamic but the variations that the group maintains can be appealing in some ways for a wider audience. There’s credit to be given when discussing this record; there’s no doubt the group want to keep their listeners on their toes, even throwing in a brass opener into the track (The World Covered in) Purple Shroud, making it almost come across to be a blues tune. It is a surprising inclusion, yet works brilliantly well, coupled with the guitar shredding and unrelenting beats, its adds a whole new dynamic to their sound. The sax makes a regular re-appearance throughout the duration, coexisting with the heavy drums and high vocalised lyrics making this a stand-out track. Blood Command have certainly produced a collection of unique sounds with this latest instalment, and it works well for their image and desired perception. If anything, Cult Drugs is a record that can easily grow on, you’ll soon be simultaneously dancing and headbanging in no time. 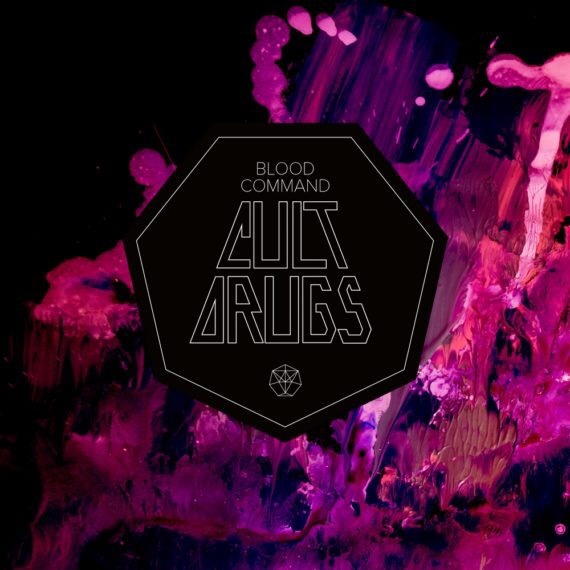 ‘Cult Drugs’ by Blood Command is released on 28th April on Fysisk Format.